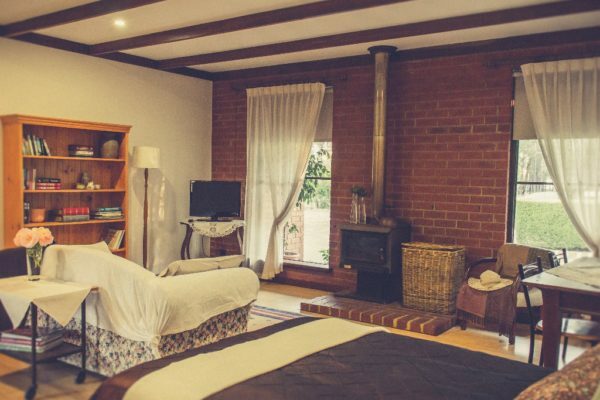 Mandia Bed & Breakfast is on a large property on the outskirts of town, surrounded by the lovely Collie bush land. This tranquil setting is just what you need for a weekend getaway. Take a warm drink in front of the lovely wood fire in the beautiful lounge room or relax outside in the gazebo and listen to the birds. The gazebo area has a gas BBQ for guests use. There are two options for guests. First is one (or all) of the three bedrooms; one queen, one double and a twin room. There is a private bathroom, separate from the owner but shared with others that may be staying at the B&B, which has a bath, shower and toilet. Second is the "bed sit" style room with ensuite. It has it's own outside entrance and a second, lockable entrance through to the main house so you can access the main kitchen area. It has a queen bed, lounge area and tv, log fire and aircon, coffee and tea facilities and toaster. A continental breakfast is included with all rooms, and you have access to the main kitchen. Cooked breakfast and evening meals can be requested at time of booking for an extra fee.